In 1987, TVS Racing came into existence with the objective of engineering the motorcycles for high-performance racing. In 1994 TVS Racing becomes the 1st Indian manufacturer to launch one make racing in the country. Today with 35 years of racing, TVS has been an unstoppable force in the world of Indian Motorsports and the culmination of it all is this new TVS Apache RR 310. On the racetrack, the RR 310 has already proved to be a fun motorcycle. but how many race tracks do we have in our country ? or does everyone who buy this bike take it to the track often? 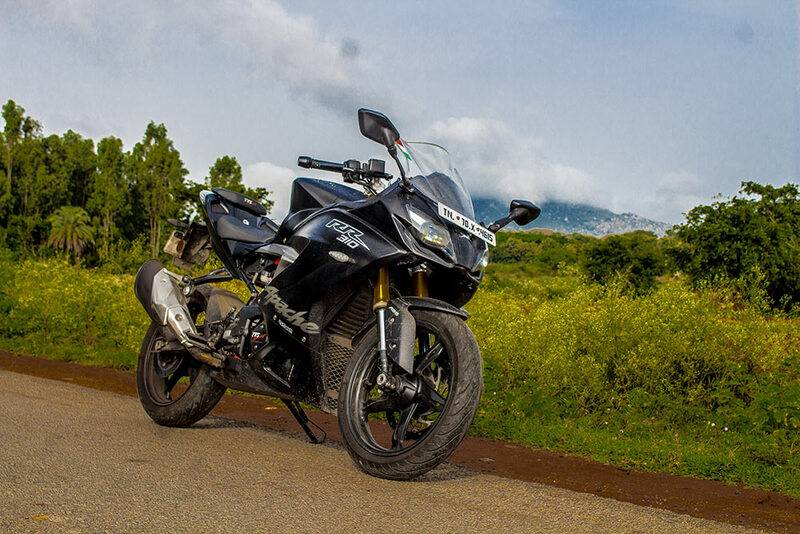 Hence its evident that a bike of this genre should have a balance of touring a pro riding. 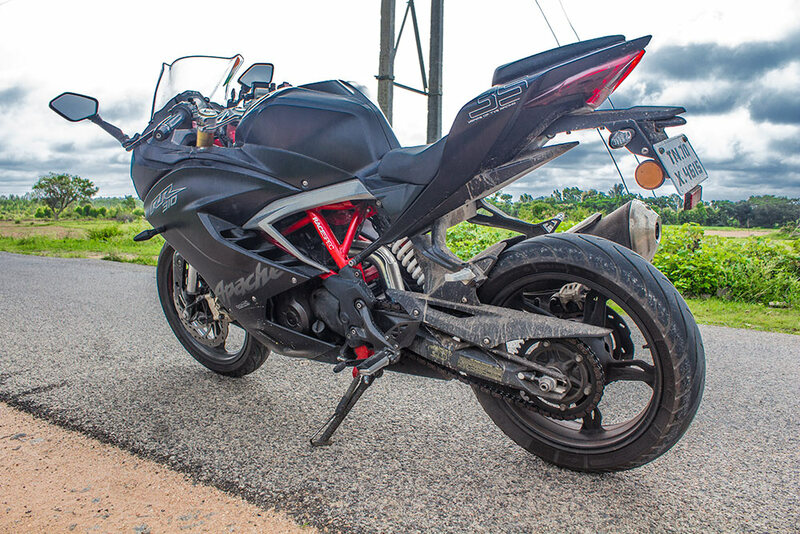 Here is our detailed road test review of the Apache RR 310 to find out how Practical it is as a Complete package. 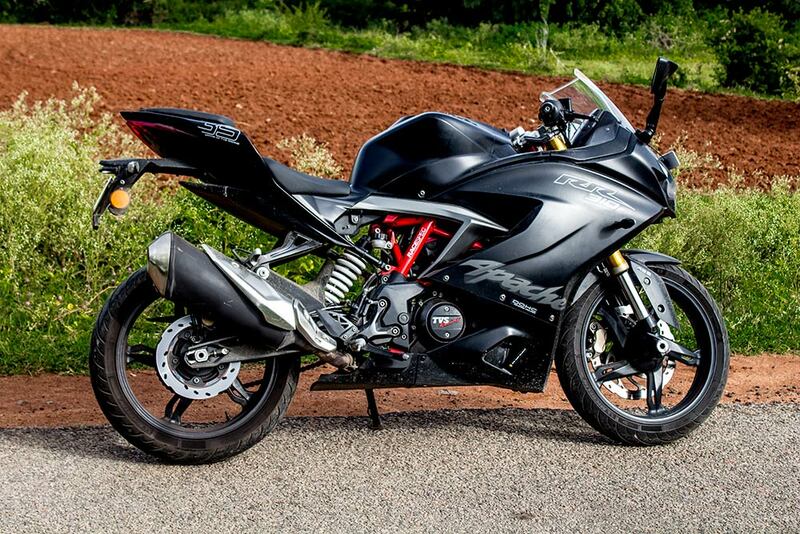 TVS Apache RR 310 is aesthetically the best-looking motorcycle that has ever been made from a domestic manufacturer. TVS has clearly taken the game to the next level with the front-end which is inspired by a shark alias Akula 310. The RR310’s design is the result of over 300 hours of wind tunnel testing. The RR 310 claims to be the benchmark in aerodynamics for an Indian motorcycle in this segment. Up front you have twin projector headlamps with LED daytime running lamps, which not only look good but have more than a decent throw and a strong beam, helping with night riding. The red frame and golden forks brighten the motorcycle up and are certainly looks great with a matte black paint scheme (the one which we are testing here). 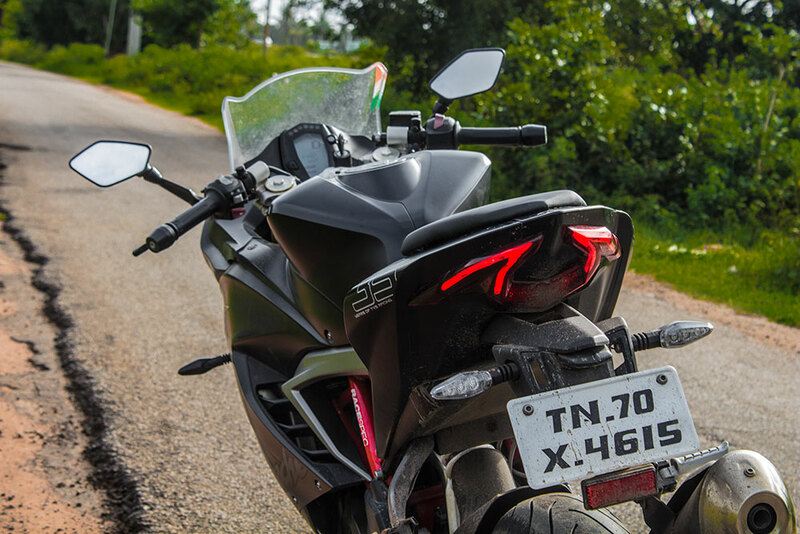 The fairing panels are modern, making the RR 310 look gorgeous in profile, especially in matte black. The most dramatic bit of design on the RR 310 is the tail section which gets Omega-shaped LED tail-lamps and a ‘35 years of racing‘ decal. In typical TVS fashion, the fit and finish are excellent. The plastics, the welding are all done neatly. Instrumentation console, which is fully-digital and displays a tonne of information such as speed and revs, distance to empty, lap timer, 0-60 kmph time, two trip meters and other stuff such as average speed and fuel consumption, top speed touched and so on. There is a small digital tachometer, a gear shift indicator, a hazard light button on the outside and all the tell-tale lights at the top and bottom. However, the cluster seemed pretty cluttered and scrolling down all this host of information it is a bit stressful. 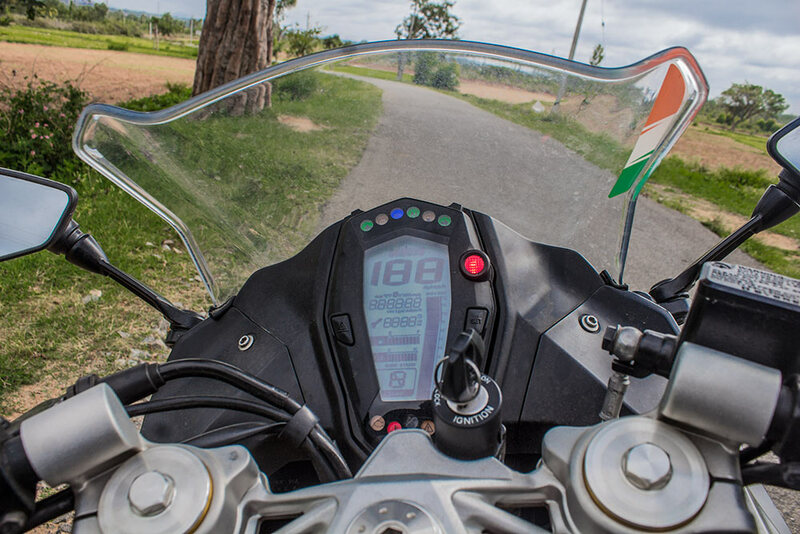 The switchgear is all high-quality switches directly taken from the BMW G 310 R. There’s also a soft, positive click when you operate the switches. The riding geometry is comfortable, Thanks to the ratio of seating position and handlebar reach on offer which provide a comfortable riding position for a good amount of time.With a seat height of 810mm, even short riders should be able to manage the bike with both feet on the ground. Meanwhile, a ground clearance of 180mm allows you to tackle most tall bumps with ease . Seat cushioning is just about adequate and after an extremely long ride, you will put some amount of pressure on your palms. Seating position is not as focused as you would find on the KTM RC390, hence it gets comparatively relaxed ergonomics. TVS has achieved this by offering rider footpegs that aren’t overly rear-set or high up. The clip-on handlebars are also slightly raised so you don’t really have to lean in a lot. it is an engaging posture to ride with a balance of Touring and track racing. 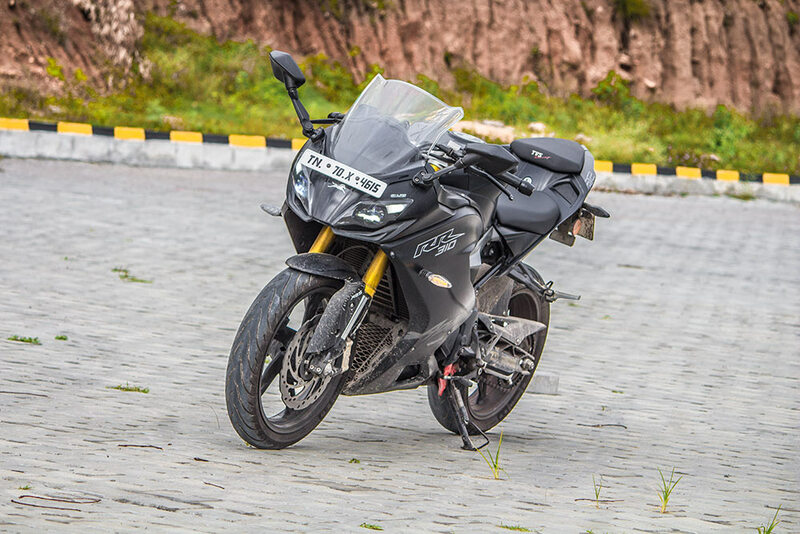 The RR 310 is powered by a 312 cc liquid-cooled single-cylinder engine that is capable of 33.5 bhp at 9,700 rpm and a peak torque of 27.3 Nm at 7,700 rpm. The grunt is sent to the rear wheel via a six-speed gearbox. The BMW-sourced cylinder is canted towards the rear in order to keep the mass centralised and the wheelbase short which result in makeing the bike agile and stable in corners . The gearbox is precise but not exactly a slick shifter, RR 310 has a 165 km/hr top-speed but there is no genuine top-end rush with linear Power delivery balanced with spot on throttle response. The engine is almost vibration free between 3000rpm to 5000rpm hence most city rideing condition is comfortable in this rev range. However, rev it harder and the vibes start creeping on to the handlebars and foot pegs. At 6000rpm to 7000 rpm the surge of vibrations is very harsh , its felt even on the seat. The bike is stable and responsive with a kerb weight of 169.5kg. The torquey nature of the motor is more apparent with a pillion on board . 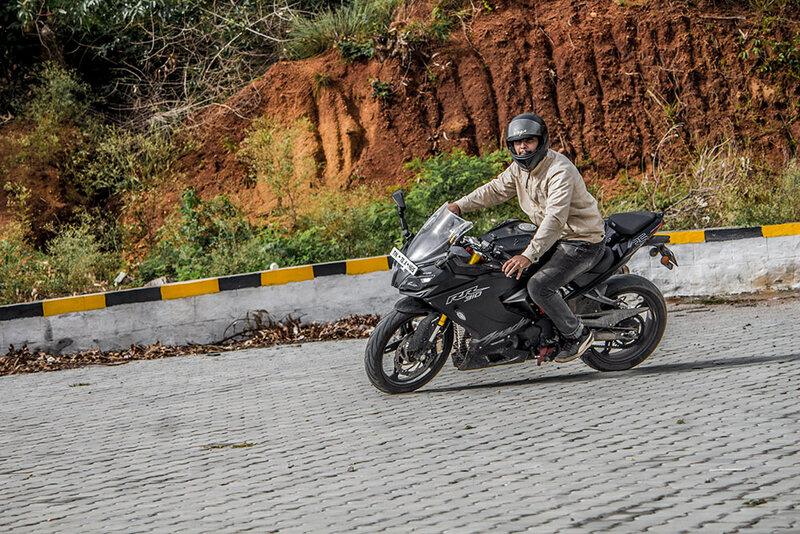 Even when riding two-up, the RR 310 was willing to pick up from slow speeds in high gears without any signs of lugging and providing with loads of torque everywhere in torque band. 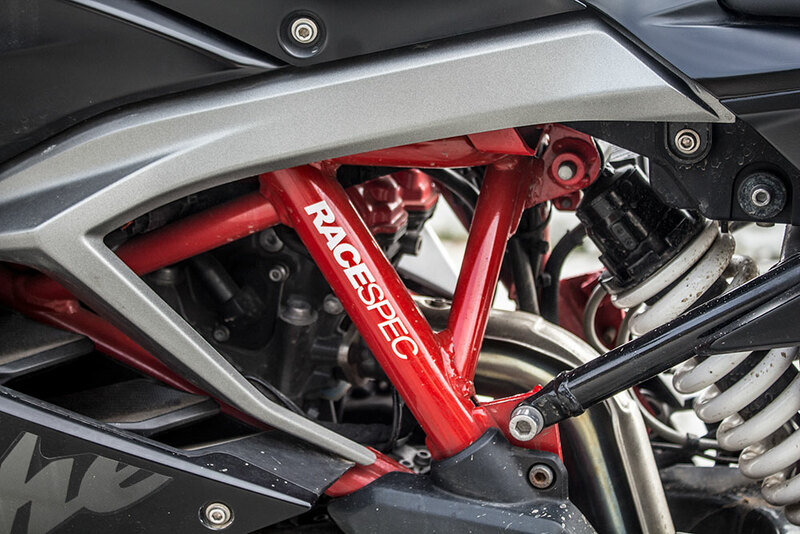 Despite being a sportbike, the RR 310 gets an impressively tight turning radius. 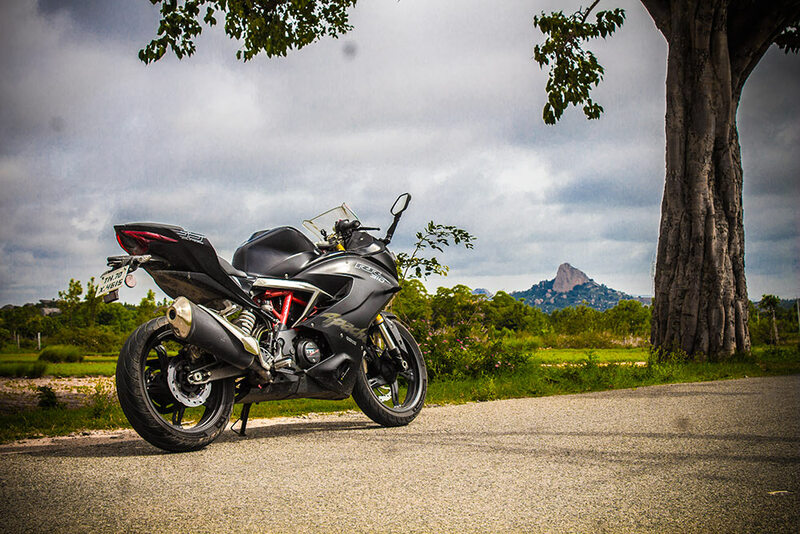 And that’s thanks to its wheelbase of 1365mm, which is just 8mm more than the 390 Duke – a street naked motorcycle as a result flicking around in tight traffic is fun like a naked bike . Braking is done by a 300mm petal disc up front and a 240mm petal disc at the rear. It also has the safety net of dual-channel ABS. 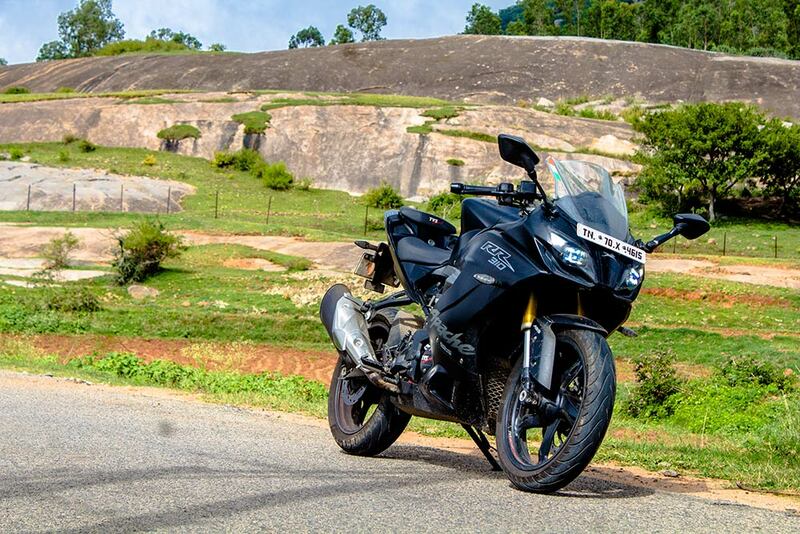 Overall, the motorcycle supports sport touring, commuting and sport riding on the track and the road. Viration at higher revs and engineing heating at city traffic in on higher Side . All this said the Apache RR310 is a Motorcylce which marks the exclusivity of a new segment of supersport in the 300cc with unmatched design and ride dynamics .